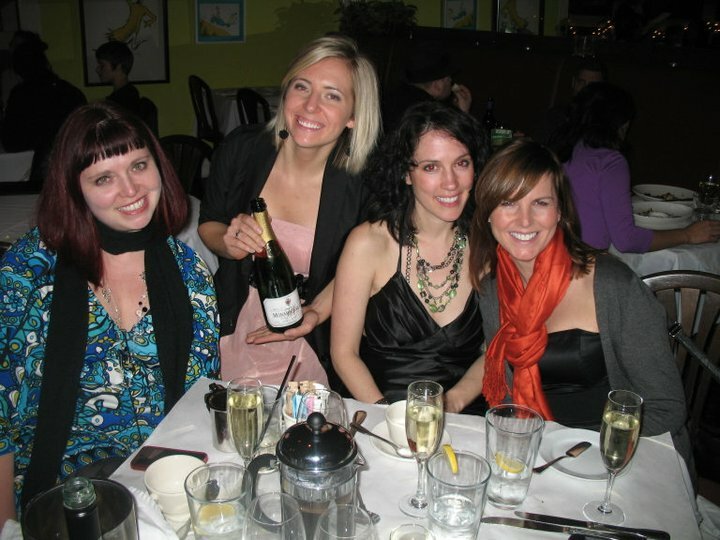 At Saturday's "CT Saturday Holiday Celebration"
Each Tuesday, I get together with three (some times four) of my best friends and we try a different type of champagne at a different local restaurant or bar. We’ve been doing this for the past three years. It started as a way to make sure we got together once a week. Then, as the recession really dug in its heels, it evolved as a way to give business to local establishments. Usually the venue we visit is pretty empty on a Tuesday, which we like because it’s quiet and we can catch up. But two years ago, we decided to get together once on a Saturday instead of Tuesday. We did it during the holidays so we could exchange gifts, get dressed up and stay downtown. 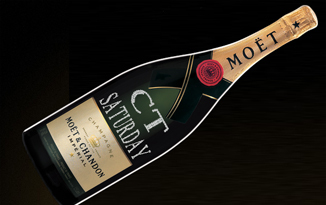 Part of my gift to the girls was this special bottle of Moet which I got personalized at MyMoet.com. It was so cool I had to share. You just go to the site, choose your size of bottle, type in your message and then you can preview it and buy it if you want! Thought I’d tell you about it, with New Year’s Eve coming up (how cool would it be to bring a personalized bottle as a host gift!) or maybe you have a little champagne group of your own!